From $35.00 Some options in stock. Order in the next 19 hours, 49 minutes and it will go out today! Some options in stock. Order in the next 19 hours, 49 minutes and it will go out today! Q: What do children love more than Magic? 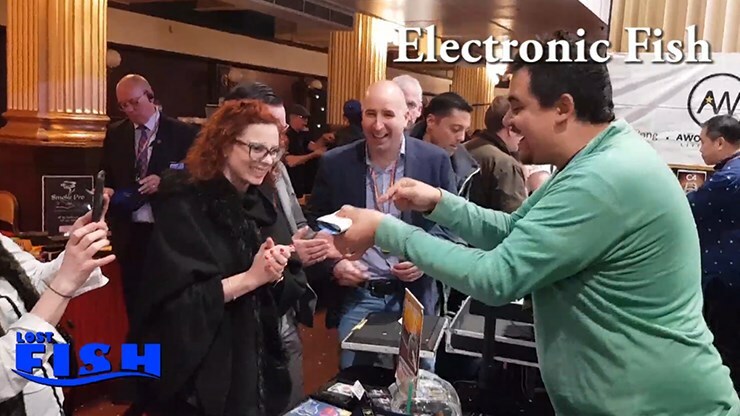 But they get Disney and Magic when you perform Lost Fish at your next kids show. 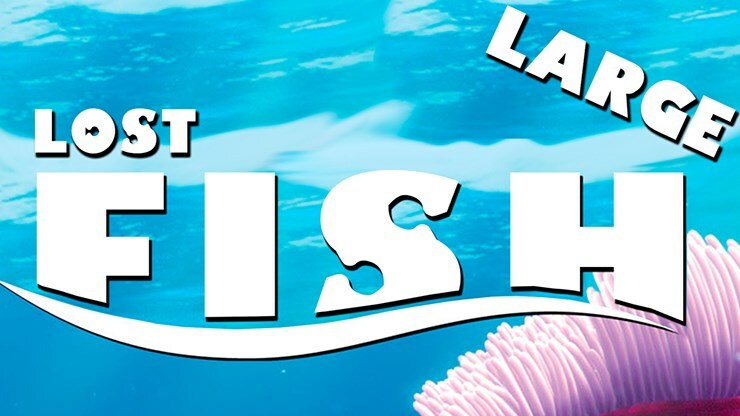 This routine combines Disney-like artwork, animated movie characters, and a cool robotic fish to create magic. Imagine how well you could make this play at your upcoming kids birthday party. 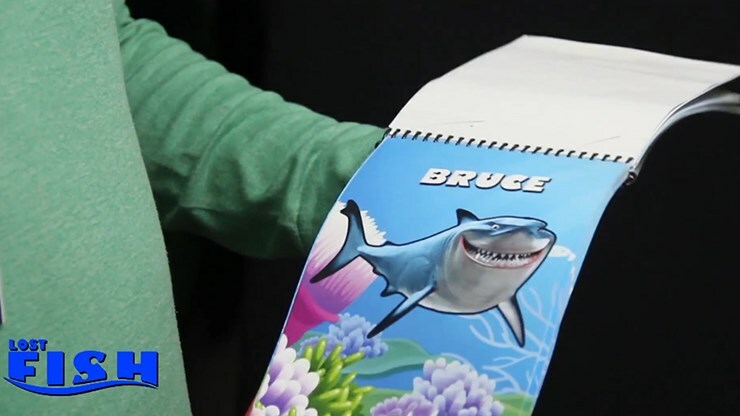 You show a beautiful color flip book (comes in two sizes) filled with cartoon characters of fish that kids will recognize from the Disney movies. All of their favorites are there: Dory, Crush, Marlin, Bruce, Nigel, Deb, Nemo and more. One child “randomly” selects a page with Nemo pictured. You tear it out as the kids tell you all about Nemo and his adventures. 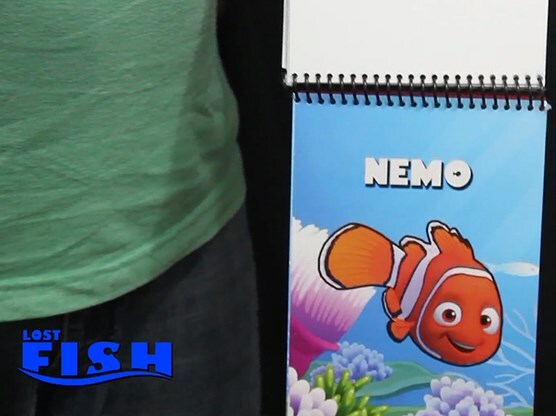 You roll up the page into a tube… and pour out…a Nemo fish into a water-filled fishbowl! (It’s a water-activated robo-fish that starts swimming as soon as it hits the water. It looks real from even a short distance as it swims in the water). Amazingly, the fish exactly matches the selected cartoon character. But wait. There’s more! For the finale, you unroll the page and show that the image of Nemo has vanished! The high-quality printing and professionally illustrated artwork of the book brings the characters to life and will captivate kids. 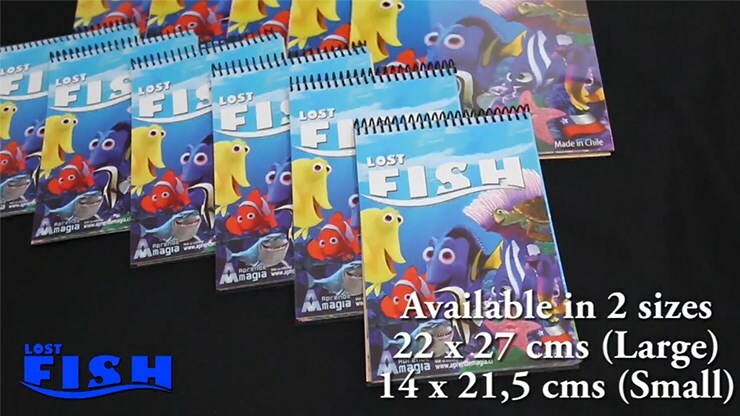 The special design of the spiral bound pad and the pages makes it possible for you to replace the selected page, so you can use it over and over again. 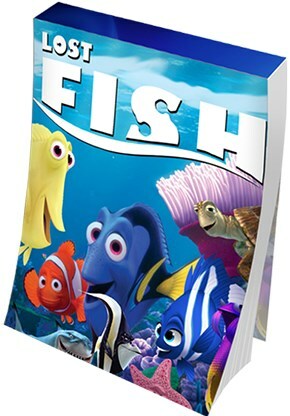 Full color book of Cartoon Fish with nine different fish characters. Battery-operated mechanical fish which activates when it’s submerged in water. You can easily learn the handling from the video instructions. There is no sleight-of-hand or palming to worry about. Using the robo-fish is much, much easier than the real thing and gets a great impact, especially because it looks just like the cartoon image! And, for the professionals, resetting the selected page back into the book takes less than a minute. If you perform for children who are fans of Disney movies (and aren’t they all? ), your audiences will be captivated by the characters and amazed by the double climax when you perform Lost Fish. Recently purchased Lost Fish! What a cute trick! Kids loved it. There’s not a lot to it... but kids mouths (and adults) definitely dropped open when the “real” Nemo appeared! That’s what I want to see!